It’s been quite a long time since archaeological discoveries have made the headlines, with most of the new information emerging thanks to the drought conditions evident across the eastern half of the country throughout June and July. Much of the focus has unsurprisingly been on the UNESCO World Heritage Site at Brú na Bóinne. ‘Dronehenge’, the spectacular pit circle first recorded by Anthony Murphy and Ken Williams, comprises two concentric rings of post-holes surrounding an inner enclosure formed by a series of segmented ditches. Its discovery was quickly followed by a better look by the National Monuments Service (NMS) at a large pit circle just to the west, previously identified on LiDAR. Taken together with Site O (the embanked enclosure to the east detected from Air Corps photographs in 1953), the relative situation of the three monuments suggests that they were conceived to a single design, one likely to date from the late Neolithic (c. 2900 BC). The NMS encountered a second henge complex further east along the Boyne at Site B, a low mound which possibly covers a passage tomb. Two henges with diameters well over 100m were seen for the first time, although something in the vicinity was recorded over the area by the INSTAR team several years ago. Closer to Newgrange Farm, and about 500m south-west of the great passage tomb, high-resolution photography, again undertaken by the NMS, redefined a previously suspected monument. This now appears as a double ring of post-holes, c. 30m in diameter, enclosing four huge post-holes, with an entrance feature on the east which was possibly also marked by large timber posts. The structure bears some resemblance to that at Ballynahatty outside Belfast. Further images from this corner of the complex also identified the arcs of two palisade trenches, some 25m apart, which if extrapolated over the landscape would define an enclosure almost 400m in diameter. As these new monuments were being recorded, archaeological excavations were ongoing at a site just south of the main tomb. Funded through the RIA Research Excavation Programme and directed by Geraldine and Matthew Stout, the excavation targeted a geophysical anomaly, the full nature of which remains elusive. Perhaps, however, the site that has received most attention is the new passage tomb and rock art excavated by Clíodhna Ní Lionáin at Dowth Hall. The new tomb is c. 40m in diameter, approximately half the size of Newgrange, and was discovered during archaeological investigations by the agri-technology company Devenish and the UCD School of Archaeology. Dowth Hall and lands were acquired by Devenish in 2013. To date, two burial chambers have been discovered within the western part of the main passage tomb, over which a large stone cairn was raised. The six kerbstones identified so far would have formed part of a ring of stones that followed the cairn perimeter. 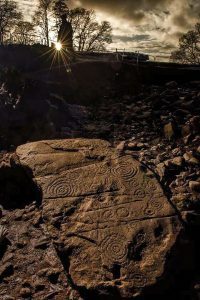 One kerbstone is heavily decorated with Neolithic carvings and represents one of the most impressive discoveries of megalithic art in Ireland for decades. Meanwhile, Murphy and Williams have continued to discover new monuments with their drone, the most impressive being a possible barrow cemetery in the Tara–Skreen valley. The reporting of new sites has encouraged others to ‘virtually’ take to the skies, which has resulted in the generation of hundreds of new images. Unfortunately, most of these ‘new’ sites have been previously recorded and their locations mapped on the NMS historical environment viewer (www.archaeology.ie). Drone overflights around Knock Iveagh in County Down, however, have recorded several new monuments across the complex, which only supports local people’s contention that the principal monument should be protected within its wider cultural landscape. The discoveries at Brú na Bóinne are all the more significant as the area has been afforded UNESCO World Heritage status. Minister Josepha Madigan, commenting on the flyovers, said that ‘this investment in the past will inform many generations of archaeologists, scholars, historians and indeed the broader public understanding of where we, as an island nation, came from and indeed the possibilities of where we could go’. Although the latter point wasn’t further elaborated on, the Minister continued in a poetic vein: ‘Illuminating our past and our ancient landscapes, these shadows, cast by our forebears from thousands of years ago, fall gently on our shoulders, just as we stand on the shoulders of those who built these monuments’. For the general public, however, there arises the question of what happens now. According to the Department of Culture, Heritage and the Gaeltacht, as a first step the findings will be mapped to place all discoveries in the context of the archaeological landscape of Brú na Bóinne. As that analysis progresses, the NMS will bring together all stakeholders to share the full results of the survey work and to initiate discussion on future archaeological research aims for the area.